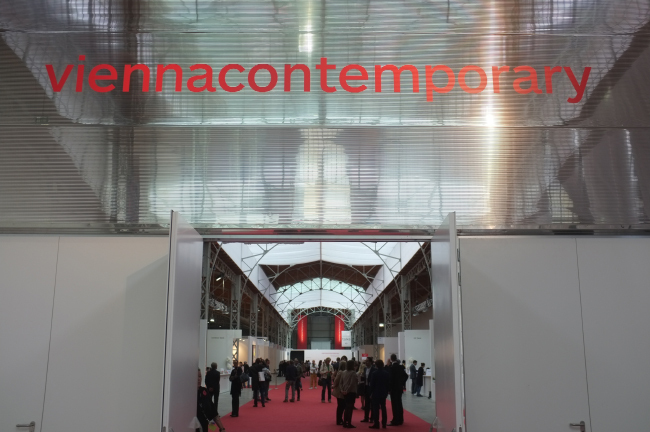 From September 23 to 27, Vienna hosted the international contemporary art fair Vienna Contemporary, a coming together of art galleries from all of Europe and the post-Soviet territories (in all, 99 galleries from 25 countries) that, according to its organizers, attracted 27,725 visitors. 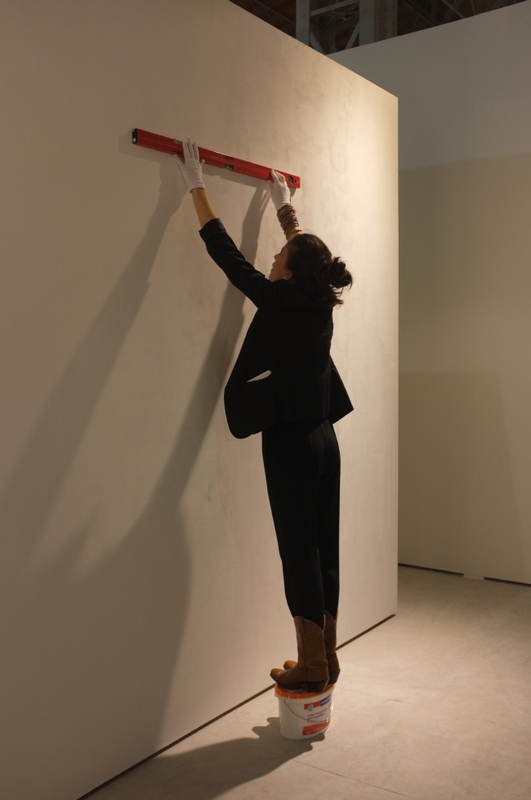 This fair is notable for being the only one in Europe providing, alongside art galleries from Western and Central Europe, such a vast insight into the art scenes of Eastern Europe and the post-Soviet territories. It is salient to note that this was the first iteration of the fair under the title of Vienna Contemporary; its organizational core was made up of people who had previously worked on the ViennaFair team. Being at the center of Europe, Vienna is cognizant of its status as a cultural crossroads. It is quite possible that the cosmopolitan history of Austria-Hungary is behind the city's open character and encouraging attitude towards the most assorted variety of nationalities. In the context of the jolts and problems currently facing Europe, the crossroads status of Vienna has become especially pronounced. One of the city's taxi drivers – a Viennese of Turkish extraction and a patriotic supporter of Austria – admits to taking part in the burgeoning business of transporting refugees from the Hungarian border to Vienna, from where they head on in the direction of Germany. From afar, the hysteria of the mass media has generated the feeling that in Vienna, politics have become more important than the opera. Admittedly, the harsh reality of the current Schengen Area situation – which calls attention to itself when one drives across the border into Austria – and stories told by taxi drivers are also a part of the reality of today's Vienna. But also just as vital is the Vienna State Opera building (which, in the evenings, shows live performances on a special screen hung on its facade), and a slew of great exhibitions and permanent art exhibitions in various diverse places throughout the city. Among these is the legendary Museum Quarter (which includes the Vienna Kunsthalle, the Leopold Museum and MUMOK), the Albertina Museum, and private institutions such as TB A21 (Thyssen-Bornemisza Art Contemporary), which now has a new space in the fashionable Augarten neighborhood. 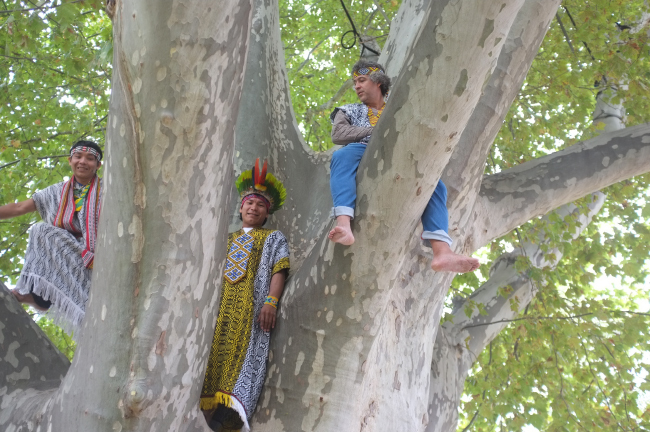 At the latter, during the Vienna Contemporary (and through October 25) one could see one of the season's most spiritual art projects – the works of the celebrated Brazilian artist Ernesto Neto, which were created as a cooperative project with TB A21 and the Huni Kuin people, who live on the border between Brazil and Peru. It is a poetic, sense-provoking and almost hallucinogenic story of man's relationship with nature; a kind of journey back in time, to the historic roots of humankind and the ancient knowledge, wisdom and soul that have been lost to so-called progress. In the intellectual hustle and bustle of Vienna, it was refreshing to see Neto attendant at his own exhibition, graciously handing out autographs, as was his willingness to climb a tree for a photo shoot while visitors to his show drank coffee in the outdoor cafe at TB A21. Meanwhile, the public opening of the exhibition of privately-owned works by Edvard Munch – at the Albertina Museum on September 24 – seems to, despite the cold and blustery winds that day, have tempted the larger part of the city's inhabitants to come out of their abodes. People are standing in line for art, and the Museum is packed like a can of sardines. Looking to the future, Vienna is abuzz about the broad retrospective of Olafur Eliasson's works to be shown at the Belvedere Palace and Museum – everyone's talking about how impressive Eliasson's art is bound to look in the ornate interiors. The participants at the Vienna Contemporary were impressively diverse, beginning with the Baltics – which were represented by the well-known Vartai Gallery from Vilnius and the Temnikova & Kasela Gallery from Tallinn, a quantity of Russian galleries (the most internationally known being the Regina Gallery), galleries from Azerbaijan, Hungary, Poland, and Romania, and last but not least, blue-chip exemplars such as Galerie Thadeaus Ropac. This year special attention was given to Bulgaria, whose artistic exhibition was placed right in the territorial center of the fair. It should be stressed that the organizers of the Vienna Contemporary are able to compensate for the inescapable characteristic of vapidness that accompanies art fairs, and does so with a professional and excellently arranged presentation by artists and curators, and a just as well-put-together program of talks and discussions. At the same time, they haven't forgotten their main assignment – to maximally secure the attention of collectors, and to sow as far as possible the seeds that cultivate a passion for collecting. Which is why at this year's fair, along with focusing on expected activities such as representing artists and holding theory-filled discussions on art processes, just as important were talks by and with collectors – on the aspects of collecting contemporary art and on the phenomenon of corporate collections, as well as educational talks on avant-garde movements in Eastern Europe, the role of art in today's society, and so on. The Vienna Contemporary's democratic and unforced atmosphere, and its broad (but not exaggerated) price range serve to whet the appetite for both new and experienced collectors. Laura Rutukė from the Vartai Gallery asserts that Vienna, up to a certain point, is a guarantee for good business. 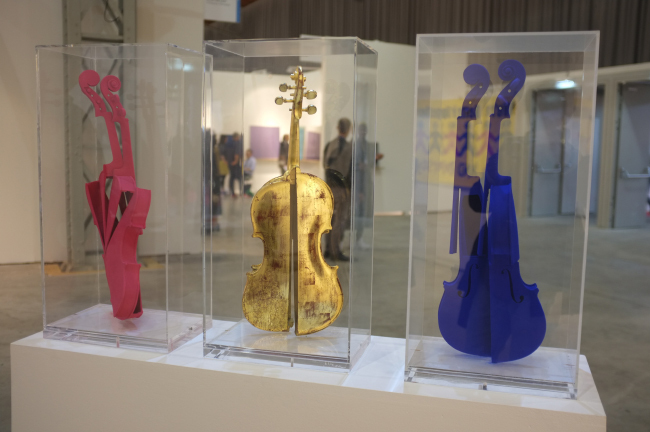 For not much money, here one can purchase artworks by students of the University of Applied Arts Vienna, and at the same time, satiate a hankering for classical merits by taking ownership of, for instance, Hommage à Yves Klein by Arman, for 90,000 euros (Galerie Ernst Hilger), or a ca. 1980s painting by Viennese “actionist” Otto Muehl (Konzett Gallery), for 150,000 euros. 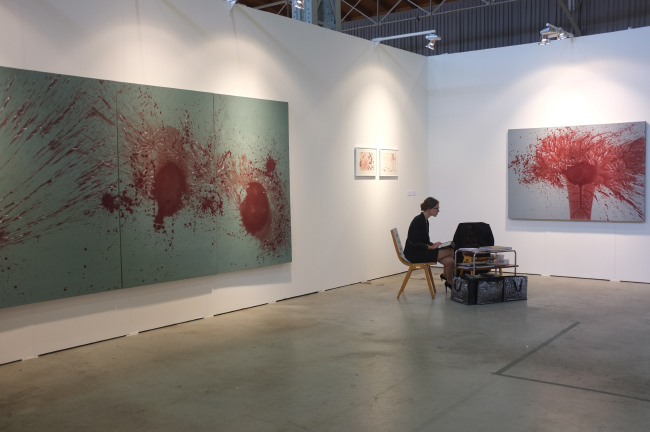 Even Galerie Thadeaus Ropac fell in step with the overall trend at this year's fair and offered several works by the young Pakistani painter Imran Qureshi at prices ranging from 16,000 to 40,000 euros – all of which, according to the fair's organizers, were successfully sold. “I think this was a successful year. In Vienna one saw a high level of works from Polish, Romanian, Bulgarian and Baltic galleries. I my opinion, this is the best place to view, discover and acquire intelligent art from Eastern Europe. The business indicators are truly good. We met several wonderful collectors for the first time, and we also saw old friends. Vienna is always able to give so much,” remarked Olga Temnikova from the Temnikova & Kasela Gallery. 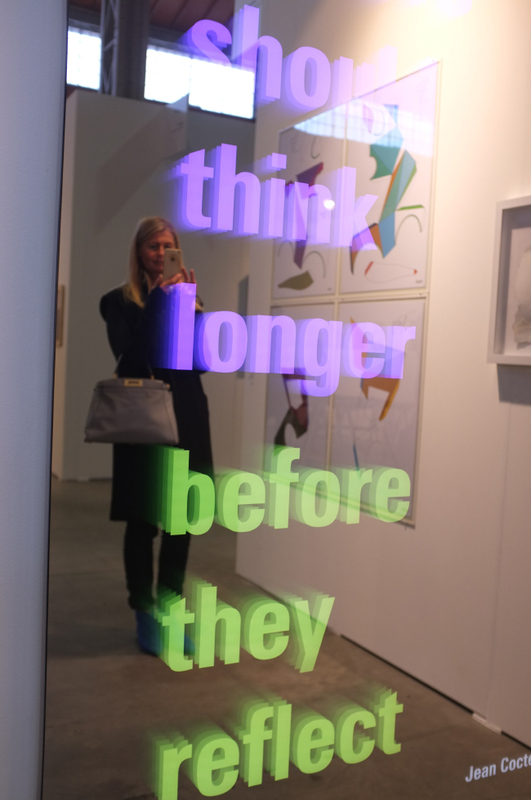 It must be pointed out that here the gallerists themselves, in an effort to bring down the wall of stiffness and the overwrought mood so prevalent at art fairs, sometimes turn to charming methods – such as a good dose of humor, or by changing the works on display every two hours (e.g., the Vienna gallery OWG). 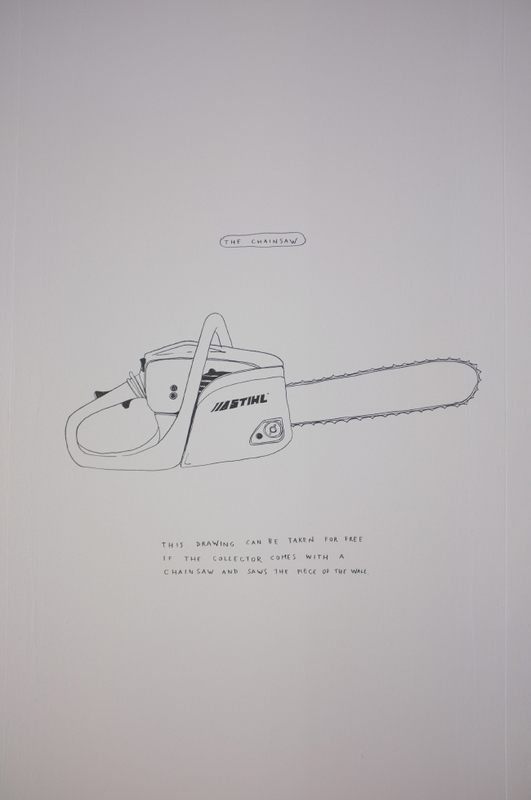 When one sees a sign on the wall of a gallery's booth stating that you can get this drawing for free, provided you bring your own chainsaw and cut it out (Viktor Bucher Gallery), one can't help but crack a smile. That seems to be the trend at Vienna Contemporary – a conscious choice to not preen one's expensive feathers, even though there are additional status-bearing names besides just Arman's and Muehl's: artists such as Franz West (Galerie Elisabeth & Klaus Thoman Galerie), Jürgen Teller and Vanessa Beecroft (Christine Konig Galerie), among others, and the price tags are not sky-high, either. However, this doesn't mean that there weren't any truly canonical pieces from the annals of contemporary art history to be seen at Vienna. 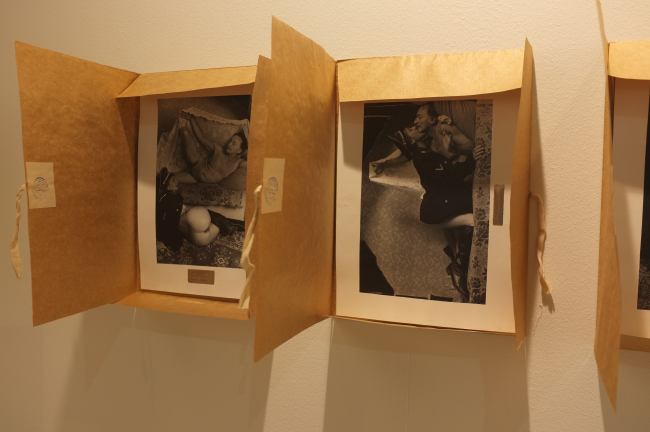 This year's hands-down favorite was the Regina Gallery's (Moscow) showing of If I Were a German, the project created by internationally-renown photographer Boris Mikhailov (in cooperation with Sergey Bratkov and Sergey Salonsky) in 1994, in Kharkov. 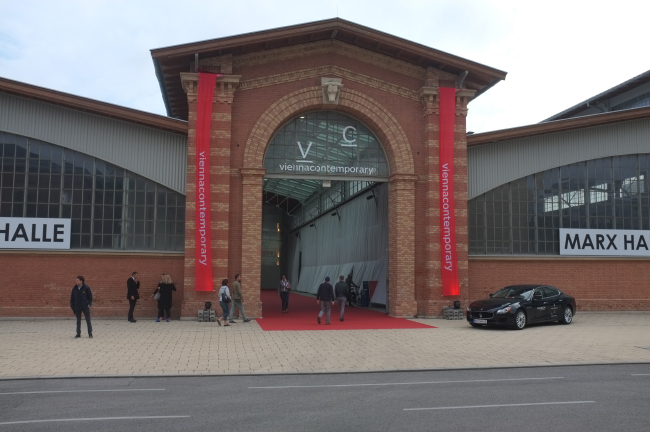 The organizational team behind the Vienna Contemporary is cognizant of the role of the educational aspect in the processes of art business and the road to success. Their VIP program at the fair has been structured with the goal of anchoring Vienna's status as a cultural space, and to make a visit to the fair an exciting – and at the same time, educational – non-stop “art race”. 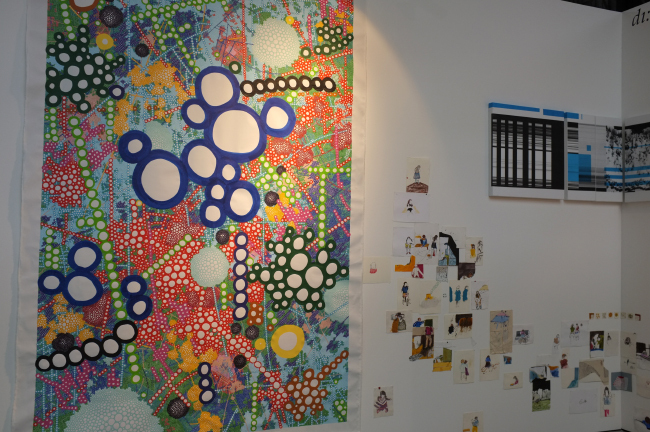 During the length of the fair, one can do more than just be a participant in the discussion and conversation epicenter that is Marx Halle; this year, visitors had the unique opportunity to see several (usually) publicly inaccessible private art collections. 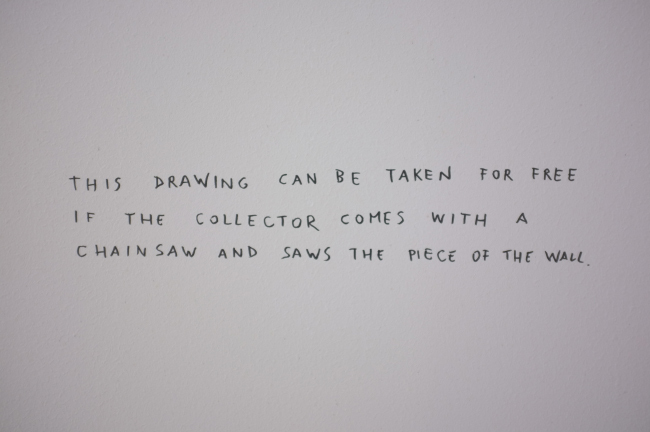 In addition, these collections were introduced to the public by their creators – collectors such as Michael Klaar and Christian Hauer. The current private museum/gallery of the Sanziany Collection, the historical Palais Rasumofsky, also opened its doors to a narrow group of interested parties. 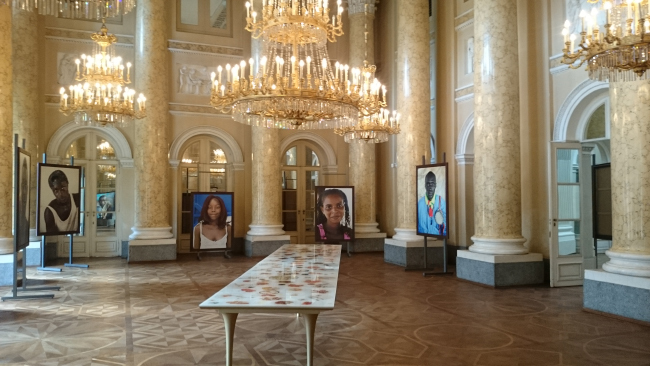 Along with showing the private collection of its owner, during the fair the palace also hosted an exhibition of works by the Spanish photographer Angel Marcos, on the very topical theme of refugees. In the grandiose halls of the palace, one could see large-format photographs of Somali refugees taken moments before they climb aboard boats – their desperate hope for a better life illuminating the stark contrast of values in this world that we all inhabit.